Yesterday, I 'finished' building my boat. Give or take a few hour's scraping and painting, but that's a formality. I placed the centre-board case, so covering the gaping slot in the keelson, and now, should the floodwaters rise, she'll float. I took a moment to sit in her, and summoned the sensations of sailing her in idyllic conditions: heard the slap of water-on-hull, the textile strain of rope and canvas, the admiring calls of the gulls. And I thought about 'the difference', that crucial difference between having built her and… not. About whether the time spent on her could possibly have been spent elsewhere to greater satisfaction. For here's a thing of beauty, a magic carpet to take me, my family and friends to places otherwise inaccessible, a place to share adventures, write stories on the pages of the ocean. Even if she never launched, I have enjoyed every moment of her build, barely a thought for the finished outcome - the pleasure of learning and building reward enough. I first thought of building a boat after a visit to the Friar's Goose marina on the Tyne, 30 years back. Here was a marina like no other - not a gin-and-tonic nor white trouser to be seen. This was a boatyard for the working men of the North East, who were damned if the ocean dream were to remain a privilege of the wealthy. What they had in spades were relevant skills, and a culture of co-operation necessary to their trades. Here, 'on the hard', rose vessels of steel, concrete and wood, destined for weekends fishing or blue water cruising. And, if time and resources meant a long, slow build, then so much the better - that meant more days immersed with mates in the build, more evenings quaffing Federation lager and Dog in the bar. And it was behind the bar that fading, colour photos of Jimmie's ketch in the Bahamas, of Alan's sloop in the Med. sat as proof that some, at least, had made good their escape. That was sufficient hope, it seemed, to give focus through the months, years and pints, the faith from which all things are built. We can forget that Adventure is essentially Democratic. We can think that we need money, time, kit, training to get out in the mountains, on the water, on the road or in the air. This is often true, but not necessarily true. Think of the climber, Joe Brown, who started out with discarded clothes' line for rope; of Ridgway and Blyth rowing the Atlantic in a wooden dory, and of Ted Simon riding the world on a Triumph Tiger. Sure, we can tell ourselves that we can't possibly go into the wild without the best kit, that we have to stay safe, and rightly so. But we are equipped with a capacity for imagination which can at once guide us to appropriate adventures, and help us enjoy them. Can't afford a yacht? then build a canoe, and explore the coastline like no-one else can. Pilot's licence beyond reach? Go paragliding, and really fly. We knew about this in the past - before we were embarrassed to be seen in a converted lifeboat, or feared the consequences of hitch-hiking. If you want adventure, it's out there. 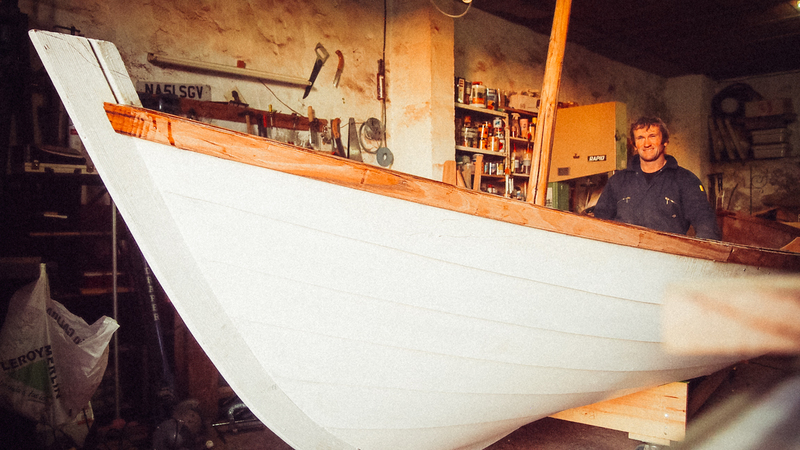 Start dreaming, get the plans, build the boat… and in a couple of year's time you, too, can be sat in a shed dreaming of the High Seas! Idiot, it's meant to be on the water! We understand that safety is paramount: our tours are designed to comply with BS8848, the 'Gold Standard' for operation of adventurous expeditions. Our characterful guides are trained expedition medics & competent mechanics.